Yesterday, I was reading a book and learned a new word. Or rather, I read an old word used in a way that was new to me. It was “condole,” as a verb, as in “I’ve come to condole with you.” We’ve all heard “My condolences,” which is one of the things it’s socially acceptable to say to someone when they’ve suffered a loss. I wish condole was still commonly used, though, because I like that it’s active. To give someone your condolences is nice, but it’s generally passive, since you can say it and move on. When someone is dealing with grief, it’s much harder to be with them and grieve as part of an active process. It’s hard to open yourself up and experience that feeling. Right now, everyone in the Warcraft (and MMO community) is dealing with varying degrees of feeling about the fate of Joystiq, and by extension, WoW Insider. I can’t speak for anyone but myself, but I have a complicated relationship with WoW Insider. I loved it unabashedly as a new player and looked up to the people I really didn’t know who wrote there. Later, I got to know some of them half as well as I would’ve liked because I did work there for a brief and important time. That time was a stepping stone to more writing, although I had to work through my own feelings after budget cuts caused them to have to lay off class columnists and other writers. It’s a strange place because I can relate to their loss but it’s not wholly my own. Even my feelings about working there weren’t simple. I used to hit the submit button with a frisson of pure terror. I read the comments on my columns with great anxiety (after having Rhidach and Vosskah tank them for me), and even now I can’t bring myself to reread the articles. Looking at them makes me queasy. Perhaps I would’ve grown more comfortable there in time, but writing for such a wide audience was stressful for me personally. “Thick skinned” isn’t really anywhere in my personal descriptors. The loss to the Warcraft community is a more clear-cut thing, and it’s significant. Over all the years that I’ve been playing WoW, WI was special. It wasn’t like Wowhead or other sites because they didn’t have the same goals. (I could write a love letter to Wowhead and how important they are to the community as well, but that’s for another post.) Yes, ostensibly they are all “news sites” but WI had editorials and opinions. It ran features on the people who play this game that make it special, guild leadership, comics, snapshots from Azeroth, heck even baking and crafts. Sure, it would publish patch notes because patch notes are important to read. But later that week or the next, a writer would weigh in on interpreting those notes for the rest of us. What did this change mean for warriors or priests or whomever, going forward? PvP articles talked about issues in battlegrounds. WoW Insider wasn’t Elitist Jerks and it didn’t want to be. Its audience was anyone who played and loved the World of Warcraft, whether they were completely new to the game (WoW Rookie) or had been playing for many years. It included blog events, Blizzcon meetups, and a sense of cohesive community that’s hard to obtain elsewhere. Christian Belt read my column and he liked it. He gave me his blessing. I’d been reading him for years, and it honestly meant so damn much to me. Which really taps into the greater feeling of loss that hangs like a pall right now over our community. I’ve seen people saying some pretty nasty things and that’s really disappointing to me. You don’t have to approve of everything WI ever did to appreciate that 1) there are people whose livelihoods have been affected by this and also 2) WI is an important part of the WoW community whether you like that it is or not. If the former doesn’t move you, the latter definitely should. We are all poorer for its absence. I’m going to miss it and everything it was over the years. I don’t even know what I want to save from all the articles I’ve read over the years that I loved. Should I save my favourite Arcane Brilliance columns written by Mr. Belt? I saved all of my own, for resume purposes more than vanity. What about every Sunday Morning Funnies that linked to From Draenor With Love and helped our readership grow? I saved all of the ones that used my art in the header. I wish I could find the one where someone wrote that they loved Four as a character and that she’d made them understand why people might want ogres as a playable race. Will those people who followed from WoW Insider still read our comic if they aren’t reminded to every Sunday? 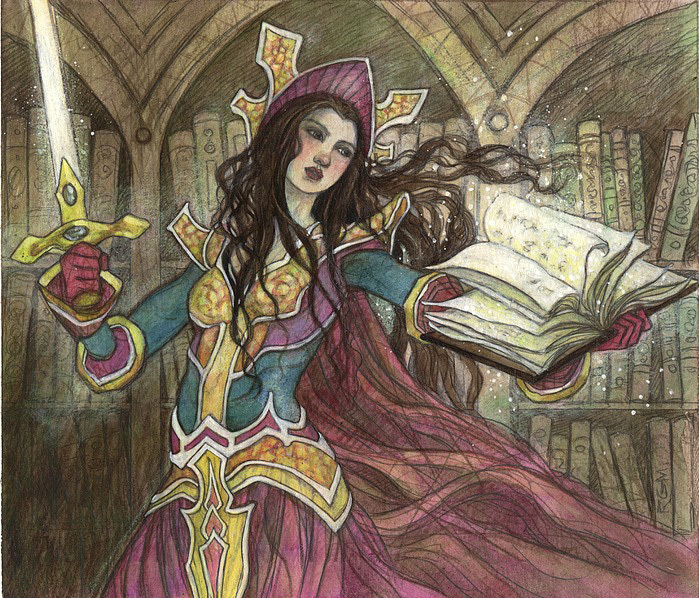 Who will feature new WoW comics and where will people find out about them now? It’s pretty obvious that subscriber numbers notwithstanding, the community has contracted over the years. Bloggers I loved have perhaps stopped writing or write infrequently (myself included). I haven’t made an effort to find more bloggers that I love although I’m sure they are out there writing great things. It’s inescapable. I can’t imagine many people are still following this blog since I hardly write in it at all. To me, WoW Insider felt like an anchor. No matter what was going on in the larger community they were still there, toiling away. For a brief moment I contributed to that and it was important to me. To everyone, past and present, who wrote for or contributed to WoW Insider and made it what it was: Thank you. To Alex Ziebart and the editors who chose to let me be a tiny part of it: Thank you. To everyone who ever commented or cared, submitted something or linked something to their friends: Thank you. You’re what created a community that I largely took for granted, assuming it would always be there. You all have my condolences, or if you prefer – I am condoling with you, as we’ve all lost something great. I can talk about this here now because the news is public: due to budget cuts, WoW Insider has had to let much of their feature and columnist staff go. That includes me and all of my columnist friends at the site. I’m glad that many people will still be writing there, but I’d be lying if I said I wasn’t sad on my own behalf. Writing for WoW Insider has been a great experience for me. I was able to write for a much wider audience as well as having to be much more critical when it came to my writing in terms of both content and length. Voss says I’m long-winded, which is probably not untrue. I tend to get rambling and then before I know it I’ve written three essays instead of one. Staying within the word constraints (1000-1500) was a great exercise in restraint for me. It’s forced me to be more concise and also to make calls about what is really necessary and what isn’t. I’ve also had to reconsider the rambling structure of what I write. Overall, I think it’s made me a stronger writer and I’m incredibly grateful for that experience. Of course, another effect of writing there was that Manalicious suffered in terms of updates and I do regret that. Between the pressures of updating a weekly comic, a personal blog and a bi-weekly article about mages, this place has collected a bit of dust. Now that I will not be spending the time writing for WI, I intend to redirect that passion back into this site. I’ll be posting much more regularly as well as possibly overhauling the layout and updating some things. (My least favourite part of maintaining a blog, if I’m being honest with you. I’m not very technical). But the fact of the matter is that I still want a venue to talk about mages, my favourite class and the thing that really keeps me logging into World of Warcraft along with the awesome people in my guild. I will, of course, still write about the old standbys here too: whatever is going on with Business Time (still recruiting, by the way) as well as art and personal anecdotes where applicable. I also talk about baking things. This isn’t WI and it has a much smaller audience and is part personal blog as well. I may also post fiction from time to time, though I’ll be tagging it so people can skip it if they like. I know it’s not everyone’s cup of tea. On a related note, as I’m losing a bit of my income I would like to step it up with the business side of art – commissions, etc. I’ll have more info about that for you soon. I’d love to do another set of Blizzcon badges for anyone who is planning to go this year. Those were so much fun and I loved doing them! In terms of what am I going to actually be writing about: I have my third article about challenge modes more or less written. It didn’t fit well within the word limits and is mostly my personal notes about each CM, but I think it’ll fit very nicely here. I’m also eagerly awaiting news about our talent changes that is bound to drop anytime now. Celestalon’s hinting has me in great suspense! So if this is your first time dropping by Manalicious, hello, welcome, have a cookie, pull up a chair. Things are a little more conversational here and I try to respond to comments when I can. I also have a strict “don’t be a jerk” comment policy and I will lay the ban down on someone really quickly if they come here and get out of line. Be polite and you are welcome. I’m Canadian, after all. To folks who’ve been reading here for years, even when content was a bit sparse, thank you. Without you I wouldn’t have had the opportunity to write for WI at all and I am so glad that I did. Here is a picture of the cake I baked the day that I heard The News about the layoffs. It’s this yellow cake recipe that Sally (Sarah Pine from WI) gave me. What’s brilliant about it is that it’s an old-fashioned, one bowl affair. You sift the dry ingredients into the bowl and then just toss in the milk and butter and let it mix. I set a timer and let the stand mixer go to town on this bad boy. The end result was delicious, very flavorful and moist. 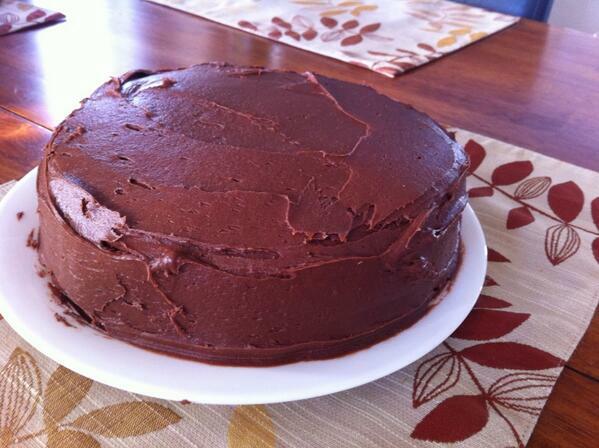 I frosted it with a chocolate sour cream frosting from another recipe book I had. It was the perfect cake for a bad news day. Here’s hoping that things will start looking up from here on out, though, and best of luck to my former and current colleagues at WoW Insider. It was fun working with you. I wish we could have some cake and beverages in person. Instead, just know that I raise my glass to you all!